Expand My Thinking: Do We Really Value Social Responsibility? Do We Really Value Social Responsibility? One of the many things public schools are held accountable for is helping to create socially responsible citizens. Several social dilemmas are clearly within the immediate mandate of our schools (literacy, for example); however, many other problems invariably get added to the list of things we hope schools can fix. Bullying, obesity, physical inactivity, substance abuse, mental health issues, environmental stewardship and social media awareness are recent examples. I accept this responsibility as public schools should play a critical role in developing thoughtful and socially engaged citizens. However, we need to be realistic about the impact schools can make as I wonder how valued social responsibility truly is in Canada? The vast majority of young people I have worked with are remarkably thoughtful and responsible. Indeed, much more so than my peers and I ever were in school. Today, it is cool to be involved - in a club, on a team, playing intramural games, acting in a play, performing in the band and choir or just volunteering to help. Students commonly initiate and organize awareness campaigns and fundraisers for a wide variety of local and global causes. Students not directly involved are much more likely to participate and support their peers than mock or remain disengaged. Since they arrive in elementary school, we teach kids about recycling and reducing their footprint; about kindness, working collaboratively and problem solving peacefully; about understanding and caring about others. These are all admirable qualities that we hope and expect of our youth; however, graduates will need to show tremendous resolve to continue along this path outside of school. While I believe most people are inherently good, our society generally pays lip service to social responsibility. Sure, some corporations market themselves as "green" or "organic" or "fair trade" but these are still the exception. Similarly, most of us donate a little, make an effort to usher our blue boxes out to the curb each week and perhaps volunteer a few hours to help in the community. However, few in a position to do so seem interested in leading real change and our mass media chooses to interpret the world through a narrow, biased lens. Global warming or famine in Africa are mostly sidebar stories. Leaders in our society consistently provide a poor example of what it means to be socially responsible. Political parties and candidates are more likely to engage in smear campaigns and run negative attack ads than articulate their ideas for transformation. Patronage appointments remain common while governments influence, coerce, exert pressure and spend money they do not have to stay in power. Greed and mismanagement have witnessed the strongest economies of the world teetering on collapse. Corporations spy on the competition, steal ideas, plot hostile takeovers, headhunt top executives or downsize and layoff long serving employees to increase profits. Governments and industries refuse to commit to international emissions agreements because it will hurt their bottom lines or possibly result in losing the next election. Evidence of cataclysmic global warming seems indisputable yet we continue to expand and consume at ever increasing rates. Obesity, poor diet and inactivity are more symptomatic of an unhealthy society than school cafeterias or physical education classes. The "occupy Vancouver" movement in the heart of downtown is another interesting example of our discomfort with meaningful social change. Despite being part of a grassroots youth movement that is present in hundreds of cities around the world, the "occupation" makes most of us uncomfortable and the media largely portrays it as an unorganized blight made up of drug addicts and the homeless. Geoff Olson provides another perspective in the Vancouver Courier that is worth a read . Many were stirred witnessing the citizens of Egypt and Libya bravely standing up for democracy. Most are proud of the courageous Canadians serving with the United Nations and helping the people of Afghanistan establish themselves as a free nation. Yet apathy sees us take our own democracy for granted. As Canadians, we are fortunate to live in one of the most prosperous, safe and democratic countries on earth. A peaceful, multicultural nation that is the envy of the world. Yet we do not engage and vote in our own elections. In the recent federal election (2008), the national voter turnout of 58.8% was the lowest since Confederation. My city of Richmond had the lowest voter turnout of any municipality in B.C. for this election at 50.7%. The three lowest voter turnouts in Canadian history have all been in the last decade. In municipal elections, it is much worse, typically around 30% of registered voters bother to cast their ballot and this can sink as low as 20% in some areas. Local governments directly impact our lives as these elected councils manage our community, neighbourhoods, parks and schools, yet 7 or 8 in ten adults don’t bother to vote. If the graduation rates in our schools were as low as the voter turnout, one can only imagine the public outcry! As a school, we are doing our part to encourage young people to participate in their democracy. We support a wide array of local and global initiatives. We hold annual elections for student government and candidates run positive campaigns and all students get to vote. We often invite MPs, MLAs, city councilors and Board of Education members as well as NGO representatives from a variety of groups (e.g Amnesty International, Rotary Club, etc.) to the school to speak. Social Studies and Social Justice classrooms are alive with debate on current events and issues as well as the formal study of political platforms, parties and procedures. Each federal and provincial election we participate in Student Vote, a non-profit, non-partisan organization that works with educators to deliver experiential learning opportunities in the form of mock elections. These are designed to help young Canadians understand and practice the responsibilities of their citizenship. Certainly a big part of being socially responsible is being informed about local, provincial and federal issues and schools are doing their part. How are you modeling this for your children? Can you influence change from the sidelines? 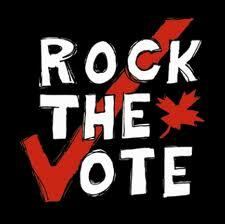 On Saturday November 19, all British Columbians are urged to participate actively in their democracy and get out and vote.